Sadly, last Thursday my pal and Alzheimer's caregiver sidekick, Harvey passed away. As many of you know, Harvey was Dotty's best friend. We tried everything we could think of, but after repeated attempts to revive him, Harvey passed on, we hope, to toy parrot heaven. Hopefully, he is now "yakking" away and eating an unlimited supply of nice fresh mangoes. Harvey will be greatly missed by both Dotty and me. The morning after Harvey passed Dotty woke up asked me, is Harvey dead? I told her he was. When she moved to the kitchen table she asked, who is this? I said that's Petey. Dotty then said, Petey you'll never be a Harvey. I loved Harvey. Folks, I did not make this up, it happened. Petey took it all in stride knowing that he had one big mouth to fill. Dotty and I decided in an effort to avoid confusion to go down to the Palm Beach County courthouse and have Petey's name legally changed to New Harvey. So Petey is now Harvey (new Harvey). This made it much easier for Dotty to make the change. New Harvey is a very kind, sweet, gentle repeat parrot. In order to help new Harvey work more effectively I had to sit new Harvey on an angle so the hole in the bottom of his base is more or less facing Dotty. Oddly, the sound of voices goes into the hole on the bottom of the base, and new Harvey doesn't work very well if the hole is not better exposed to voice. New Harvey promised that he will try and fill the void left by the now deceased Harvey. On another note. I am now in touch with a company in China that has a 6 battery version of a repeat parrot. The only barrier right now is me finding someone with a FedEX account. 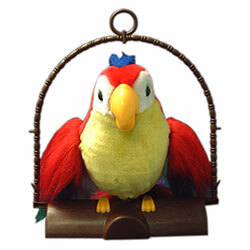 The company will gladly send me a test parrot if I am willing to pay the shipping via Federal Express. I am still working on this as we don't have a FedEX account at this time. One can only hope that the six battery version is a good as old Harvey. I am still working the world to find out if there is a nine volt battery version of Harvey being made. We will leave no country un-turned. I have written many times in the last year of the the important role that Harvey the repeat parrot played in our lives. He is greatly missed by both Dotty and me. I know you are wondering so let me tell you, Dotty has adjusted very quickly to new Harvey. Although, new Harvey can't sing or catch my voice from afar the way that Harvey did. For those of you that did not know Harvey well, here he is with Dotty.